Panoramic prints: The DS820A can print standard 8 x 10" and 8 x 12" prints, and prints as small as 8 x4", but it can also produce panoramic prints 8 x 18", 8 x 22", 8 x 26", and 8 x 32"!! Improved print quality: Fine prints with richer color and blacker blacks. The DS820A provides maximum color density and a higher gloss finish for deeper richer color and blacker blacks to enhance your photographic expressions. New luster (semi-gloss) and fine matte finishes: The DS820A provides the standard glossy and matte finishes, but also adds a new refined "Luster" and a "Fine Matte" finish. With a slightly textured surface and smooth pattern, the effect is outstanding for fine photography. Significantly improved print throughput: Compared to the current 8" model, the DS80, the new DS820A printer has significantly improved print throughput from 86 prints per hour to 125 prints. 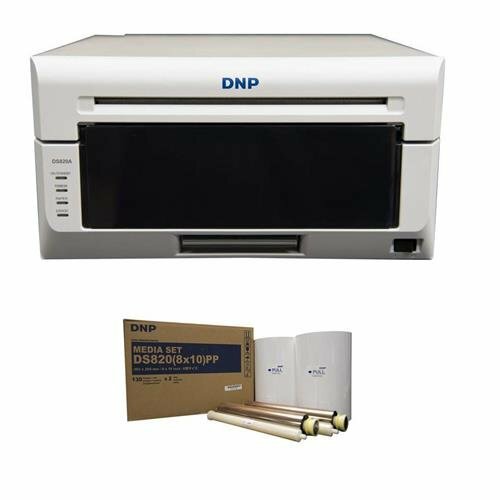 It also increased the durability of the thermal print head and reduced 98% standby power consumption compared to the current DS80 model. If you have any questions about this product by DNP, contact us by completing and submitting the form below. If you are looking for a specif part number, please include it with your message.